Aisling lives with her family and a menagerie of animals on a smallholding: she keeps dogs, horses, cockatoos, owls, hens and a couple of goats. She loves her animals and they keep her busy, especially when they fall ill.
William falls into a type of no-man’s land as far as vets are concerned. Goats are not pets, in that they don’t come into the house like cats, and they are not taken for walks like dogs. But they are not farm animals either: they don’t produce anything of value. William doesn’t resemble a horse, so an equine vet would not be the right person to treat him. Aisling has found herself taking him to different vets depending on his needs. For worm doses and other farm animal type issues, she visits a local farm vet. But when it comes to individual health problems, she brings him to our vet clinic in Bray: after all, we are “companion animal vets”, and William definitely fulfils the role of being a companion. We don’t see many goats in our clinic, but we enjoy seeing a variety of creatures, and the principles of animal health are the same for most species. It’s always a novelty and a pleasure to find William standing in our waiting room. His most recent problem started three weeks ago. He was normal when he was put to bed in his barn one evening, but the following morning, when he was let out, he was badly lame on his back right leg. He held it in the air, refusing to even touch it to the ground. There was no obvious cut or other injury, so Aisling brought him to see us. A careful examination revealed that he had a painful, swollen area around his lower leg: the equivalent of his ankle. It seemed likely that he had twisted his foot when jumping around: like most goats, he’s prone to clambering everywhere, and it’d be easy for him to land awkwardly if he fell. He was given simple treatment, with rest and a course of anti-inflammatory injections, but two weeks later, he was still limping badly. William was admitted to our animal hospital for x-rays. I was concerned that he might have broken one of the small bones in his ankle, so it was a relief when to find no sign of any fractures. The xrays showed only soft tissue swelling, confirming the diagnosis of a severe sprain. William needs more anti-inflammatory, pain relieving medication, and Aisling has to continue to try to rest him. It isn’t easy: he’s a curious, active creature, and he doesn’t want to stay still. She’s had to confine him to his barn, rather than allowing him to trot around his outdoor paddock. He is already showing signs of improvement. William loves his food, and is fed on tasty alfafa and mixed grains. When Aisling appears with a bucket of food, he runs across to meet her. Aisling has noticed that when he’s focussed on food, he now forgets about his lameness: he’s able to run normally. 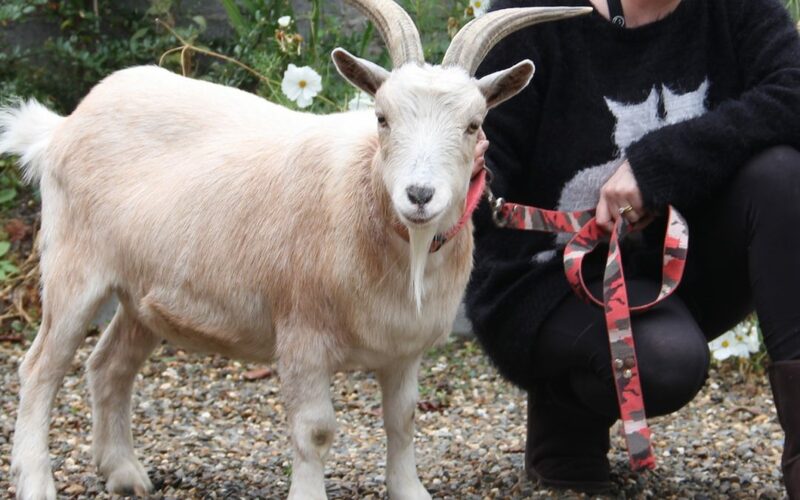 Goats are known for being intelligent creatures: is it possible that he has worked out that he gets extra attention (and sometimes extra treats) when he is lame? Aisling is keeping a careful eye on him: however clever he may be, she doesn’t want to be outsmarted by a goat!